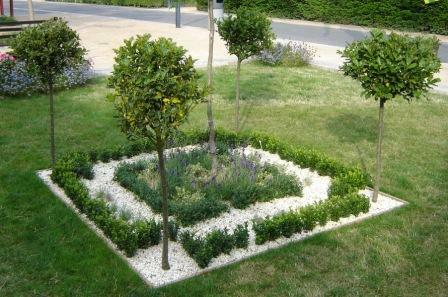 recycle a number of granite blocks to provide three sculptured seats for the Garden. The basis of the designs will be the cross sections of the three historic ships, Mary Rose, HMS Victory and HMS Warrior 1860. Since the size of the blocks vary, the size of the seats will be different and will fit into the available spaces. The grey of the granite will also contrast nicely with the red brick Dockyard Wall and make them stand out and invite interest, speculation and use. A competition is being held for local schools to design a Tudor style knot garden, which will be created around an existing Strawberry Tree. An information pack and invitation to take part, was sent out in late August and the designs are due in by the end of November. The children will be invited to help with the construction and planting of the winning design. The knot garden will enhance the visual appeal of the Porter's Garden and links in with the National Curriculum Stage 2 History and the whole exercise will encourage the children to become more involved with the garden and the Tudor period. As part of The Friends educational remit, we have obtained estimates from local firms to create two information boards to be placed at either end of the garden to inform and explain to visitors the principles behind the planting and design of the reconstructed Garden. This will eliminate the need for signs within the Garden and help maintain the atmosphere of a domestic garden. As there are a number of manhole covers awkwardly situated in the Garden. We are commissioning some 18th century planters from a local craftsman to stand on the covers and provide variety of planting and highlight small-scale seasonal planting of "florist's" flowers. The Friends maintain ongoing close links with Hampshire Gardens Trust. The Committee has all the skills associated with their jobs (current or previous) together with a considerable amount of life experience plus they are all keen gardeners. The Committee has successfully organised and paid for two wrought iron gates manufactured and installed by a local craftsman. The Porter's Garden, situated in Portsmouth Historic Dockyard, was designed by Robert Camlin in 1999 and has recently been recreated on the site formerly occupied by the Dockyard Porter's garden. The Friends of the Porter's garden took over the planting and gardening early in 2001 and have been enthusiastically digging, mowing, maintaining and filling the new flower beds with period flowers ever since. Their main objective is to recreate the Porter's garden with reference to its historical, educational and recreational value. The Dockyard itself is situated in a deprived area of Portsea with many flats with no gardens or green spaces for residents to sit in, garden and enjoy. The Dockyard itself has few green space and the Porter's Garden provides a haven of peace in the busy Dockyard environment for dockyard workers, visitors and local people to enjoy. Support comes from local schools, horticultural societies and organisations and Portsmouth Parks and Gardens. 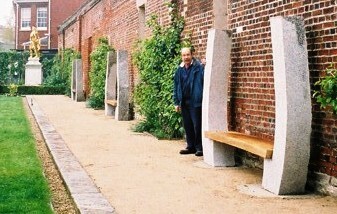 i. recycle a number of granite blocks to provide three sculptured seats for the Garden. The basis of the designs will be the cross sections of the three historic ships, Mary Rose, HMS Victory and HMS Warrior 1860. Since the size of the blocks vary, the size of the seats will be different and will fit into the available spaces. The grey of the granite will also contrast nicely with the red brick Dockyard Wall and make them stand out and invite interest, speculation and use. ii. A competition is being held for local schools to design a Tudor style knot garden, which will be created around an existing Strawberry Tree. An information pack and invitation to take part, was sent out in late August and the designs are due in by the end of November. The children will be invited to help with the construction and planting of the winning design. The knot garden will enhance the visual appeal of the Porter's Garden and links in with the National Curriculum Stage 2 History and the whole exercise will encourage the children to become more involved with the garden and the Tudor period. iii. As part of The Friends educational remit, we have obtained estimates from local firms to create two information boards to be placed at either end of the garden to inform and explain to visitors the principles behind the planting and design of the reconstructed Garden. This will eliminate the need for signs within the Garden and help maintain the atmosphere of a domestic garden. iv. As there are a number of manhole covers awkwardly situated in the Garden. We are commissioning some 18th century planters from a local craftsman to stand on the covers and provide variety of planting and highlight small-scale seasonal planting of "florist's" flowers. Natural environment: The Porter's Garden will continue to be maintained and developed by The Friends of the Porter's Garden in partnership with the Property Trust and they will act in the capacity of guardians. It is difficult to separate the natural and the built environment when speaking about a garden. The two are inextricably linked and their interaction is crucial to their successful development in the combined setting of garden, historic buildings and dockyard wall. The garden puts the built environment into context. It enhances the buildings and safeguards against encroachment. The Dockyard Wall is a Grade ll* listed building, the Lodge is Grade ll and the two statues are Grade ll listed. The regeneration of this end of the Dockyard to include the recreation of the former Dockyard Porter's Garden has transformed the area altogether. (It was previously a car park.) The garden is proving a refuge for wildlife, blackbirds have nested this year and butterflies are a common sight. We have also had a recent sighting of a humming bird moth. It is popular with visitors, the local community and the dockyard staff love it. It provides a haven of peace within the busy industrial world of the dockyard and provides much needed opportunities for informal recreation and relaxation for all. How will the project benefit local people? By having an improved facility freely available in the Dockyard and the opportunity to learn about the Garden and it's facilities. There are no similar green spaces in the vicinity. How many people currently use the facility and how many will use it once the project is completed? The Historic Dockyard is open all year (not Christmas Day) to the public free of charge (people only pay if they wish to visit the Ships or Museums). About half a million people visit each year, many of whom spend time in the Porter's Garden. The garden is one of many attractions in the Renaissance of Portsmouth Harbour scheme, which has received a high level of publicity in Building, Tourist Destination and Architectural Trade Journals over the past two/three years. The Historic Dockyard already benefits from spin-off trade from nearby Gunwharf Quays designer outlet shopping centre, and the new Portsmouth Millennium Tower currently under construction just five minutes walk away will bring more visitors to Portsmouth. The number of visitors will further increase over the next decade as the MoD releases more land and buildings into the public domain and the Historic Dockyard diversifies to include private residential accommodation, hotel and conference facilities, additional exhibition space and more restaurants, wine bars, retail outlets etc. Explain how the public will have access to the facility and how you plan to encourage Public access: Access is through visiting the Historic Dockyard. Public access will be encouraged by enhancing the facilities in the Garden by the provision of the elements of the Project, particularly the new seating, and increasing public awareness of the aims and character of the Garden. What funds have you secured for this project so far? What plans do you have for further fundraising? Attach a budget for the total cost of the project and a cost breakdown over time for elements seeking LTCS funding. Indicate the VAT status of the costs. The following breakdown of costs must be included: Staff Costs; Consumable Items; Capital Equipment; Sub-contracts (if any); Travel and Subsistence; Overheads; Other Charges (to be specified) and Total Project Costs. All anticipated income must also be shown. If applicable, give the name and address of the third party contributor and their relationship to the project. The third party contribution is a reimbursement to the Landfill Operator (Onyx) that funds the Trust. Please outline possible promotional opportunities for the Trust that may arise through the allocation of grant to your project. Include press releases and articles, installation of a plaque on completion, photo opportunities and opening ceremony etc. v. Opening ceremony by the Portsmouth Deputy Mayor, who performed the official opening ceremony in 2001 and has maintained close links ever since. Our web site is also linked to the main Historic Dockyard web site, which is visited by thousands each year. The completed garden project will be entered for awards like the Portsmouth Society Best Restoration. (The Historic Dockyard has already won a number of these.) The Porter's Garden has also, for the last two years, won the Award of Merit in its class, in the Portsmouth and Southsea in Bloom competition. The Friends Committee is actively engaged in forging links with high profile gardeners including Brian Kidd and Alan Titchmarsh who has visited the garden twice this year. Once the project is complete we intend to invite BBC 4's Gardeners Question Time to broadcast a future programme from the Historic Dockyard. I understand that any grant made to my organisation will be subject to the limitations imposed from time to time by the Finance Act 1996, Part VII of the Landfill Tax Regulations 1996 and any other legislation or regulations issued subsequently which may affect grants made by environmental bodies.